Due to the lack of good exposures and the relatively complex nature of the structure, little time was devoted to structural problems other than those that have a direct bearing on the determination of the stratigraphic sequence within the San Hipolito Formation. In general, the beds of the San Hipolito Formation comprise a southwest-dipping homocline with most dips ranging between 30 and 60 degrees. The entire length of the contact between the San Hipolito Formation and the Valle Formation has been traversed. The contact is poorly exposed due to weathering and it is covered by surficial deposits over one third of its length. Nowhere along the contact are fresh exposures of the Valle Formation and the San Hipolito Formation juxtaposed. Slickensides and fault gouge have not been observed in the vicinity of the contact. Near the contact are found facies of the San Hipolito Formation which are not in their usual stratigraphic position; these include graywacke, limestone, and andesitic rocks of unknown age. These outcrops may be slivers caught in a fault zone. The map pattern of the contact (Figure 2) suggests that it is a low angle fault that dips to the southwest. There are indications that faulting may have been active during the Quaternary. The highest Quaternary marine terraces that overlie the San Hipolito Formation appear to be at higher elevations than those that overlie the Valle Formation a few hundred meters to the north and the northeast. Also, the lowest Quaternary marine deposits overlying the San Hipolito Formation are higher in elevation in the southeast part of the area than elsewhere suggesting very recent uplift southwest of the San Hipolito fault. 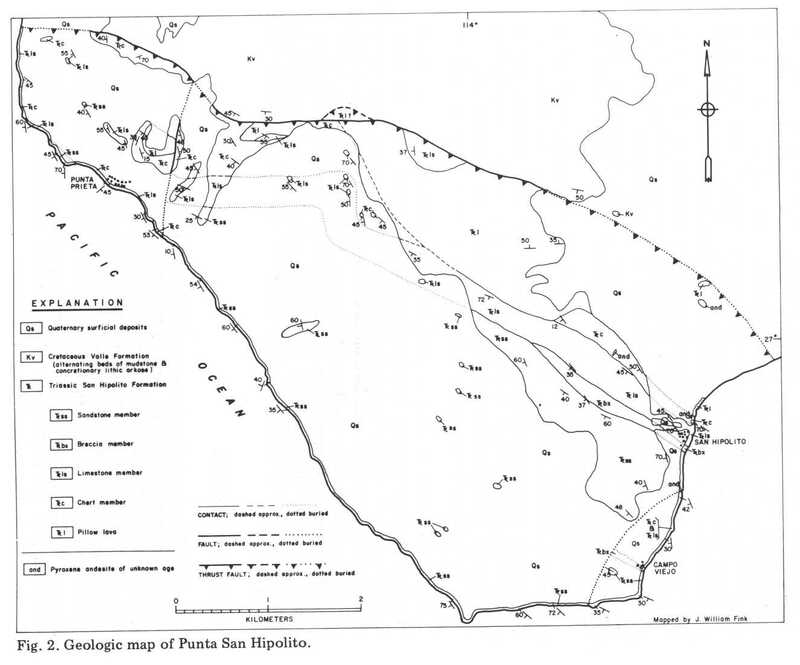 A set of faults trends from N10E to N80E on Punta San Hipolito, two of which are shown on Figure 2. The fault near Punta Prieta which trends about N10E does not extend into the Valle Formation. The other fault, near Campo Viejo (Figure 2), has 1.3 kilometers of stratigraphic separation. Many faults with very small separation, most of which strike between N30E and N60E, are found west of this fault. Folds in the San Hipolito Formation are small in size and local in extent. They are especially well developed in thin limestone beds. Cores of some tight folds are brecciated. Beds above and below folded beds are not folded. Orientation of fold axes is random. The chaotic and local nature of folding indicates that folds probably formed due to slumping and sliding of the rocks when they were only partly lithified. Minor folds and slumps are also locally present in sandstone and chert beds but they are not as well developed as folds in limestone beds. The slumping and folding indicate that the San Hipolito Formation was probably deposited on a slope.